We have never seen a show from the company FoolsFURY so we were excited to learn about their new show Role Call, which is comprised of two new one-woman shows by local theater artists. The first piece Sheryl, Hamlet and Me, written and performed by Michelle Haner “explores the costs of ambition in the digital era.” The second piece (dis)Place[d], written and performed by Debórah Eliezer, “tells her story as the child of a first-generation immigrant to America ‘caught between cultures.’” We have also never been NOH Space where the pieces were being performed. So we headed to Potrero Hill for for some new experiences and drama talk and drinks. Brittany: I wish I could say something positive, because I really want to support female voices, local playwrights and small scale theater. Both of these shows were just so out of touch with what most people would want to watch, I just don’t think I can recommend it. Katie: Yeah, I completely agree…I don’t know what else to say right now. I didn’t connect with either piece… at times they almost felt like parodies of one-woman shows. Both scripts were all over the place, they never let me fully connect to the stories they were trying to tell. And a big personal pet peeve, both of the actors did characters that had accents which were inconsistent. B: Yeah, there were tons of little messy things like that which took me out of both pieces, but I think the biggest challenges with both of these plays is they tried to do too much. The second play (dis)Place[d] had some good moments, and I liked the concept of telling this very personal story about her father’s life to explore her complicated Jewish-Arab identity. However, she tried to play too many characters, and wasn’t able to do them all well, which detracted from the story. Also that bizarre, poetic desert-goddess character really took me out of it. K: Yeah, I could have definitely done without that, and the weird recorded voice with the echo effect with the over the top movement. I did love when she (Debórah Eliezer) sang though, she has a beautiful voice. A simpler telling of the same story would have been so much better. B: Then the first piece, Sheryl, Hamlet, and Me, I didn’t enjoy at all. Sometimes actors take themselves way too seriously, and this play is a perfect example of how out of touch theater can feel when that happens. I studied acting, so I get where the breathing and stylized movement come from, but when taken to this extreme it just feels self indulgent. Am I supposed to be impressed with how actorly you can be? She made a few good points about how is Facebook creepy, but it wasn’t that insightful. It almost felt like she realized she had to make a point that people could connect with, and so she decided to pander to tech hating in the Bay Area since that’s an easy target. K: Yeah, I don’t really know what she was going for, but I didn’t connect to this piece at all. If you could come for just one of the shows (dis)Place[d] felt like it had potential, but Sheryl, Hamlet and Me I’d definitely skip. The Verdict: Not a show we would recommend for non-theatergoers. 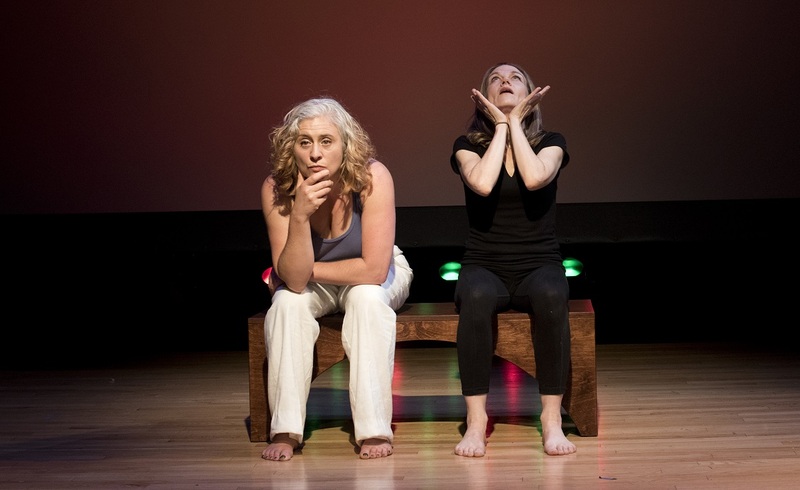 Maybe not even a show we would recommend for frequent theatergoers, although it is always interesting to see new plays by local female playwrights. The Drama Talk: While it’s clear both of the women who created and performed these shows are talented, we didn’t particularly enjoy either of these plays. They try to do too much, they indulge in overly stylized techniques to the detriment of their stories, and they just weren’t that engaging. With some major edits (dis)Place[d] could be a really lovely piece. While Sheryl, Hamlet and Me tried some interesting techniques with video, the story just wasn’t there. We didn’t care about any of the characters (Sheryl Sandberg, Hamlet or the playwright as herself), and so we didn’t really care about the play. The Drinks: We checked out Darger Bar, which was once Dear Mom. We liked the reboot. Still a lot of seating and relaxed atmosphere but a better drink and food menu. Role call plays until October 22nd at NOH Space. Tickets are available on their website for $30. Right now there are tickets available on Goldstar for $15.